It’s hard to really recommend Living Craft Beer Bar unless you’re in the area and desperate for a craft beer. It’s expensive for the beers it offers, regardless of the addition of tax and the varying prices didn’t seem to make any sense at all. While the food is delicious, especially the pizza, if you’re vegetarian then you might end up hungry here. It’s not all gloom-and-doom though as the bar is non-smoking. Located next to a bike shop, in a very quiet area it seems. It was just after New Year’s Eve that I decided to go on a mini bar-crawl around Yokohama, specifically, Kannai to Yokohama. 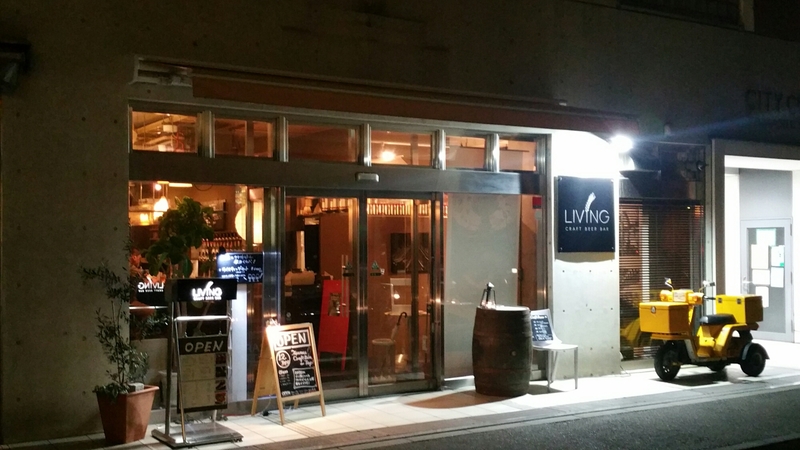 Living Craft Beer Bar is perhaps the least accessible out of all the craft beer bars in the Kannai to Yokohama area as it’s located between Nihon-Odori and Motomachi-Chugakai on the Minatomirai line. Moreover, it’s located in some back street areas far away from the main craft beer area of Kannai. What better way to start off the drinking by going to the bar furthest away? Living Craft Beer Bar opened in 2015 and filled a void in the area of those two stations. I can’t honestly say I’ve used either of those two stations unless I’ve gone to a beer festival at Ōsanbashi pier or going to Chinatown, so to have another reason is always welcome. It isn’t located in a hustling area, with only a few cars passing by and even less people though it was the Tuesday after New Year’s so perhaps people were laying off the alcohol for a bit to allow their liver to recover. As you go into Living Craft Beer Bar, there is a small exhibition area with a few pieces of artwork to view. The bar itself is a nice cosy area, with about ten seats at the bar and a couple of secluded tables at the back. When we arrived at 5pm, we were the only people there; however, within an hour, the bar counter seating had filled up and people were sitting at the back tables. Pretty good going for a Tuesday night. The only issue with the atmosphere at Living Craft Beer Bar was the music. If you like cheesy 80’s hits, then you will feel right at home. Notable highlights included Wham, Whitney Houston, Ultravox, and some Eurythmics too. I guess someone didn’t like the music at Thrash Zone. Strange decisions when it comes to pricing. Why are some beers more / less expensive than others? The tap list was very good on the day we went to Living Craft Beer Bar. There are twelve taps available, though only ten were being used on the day we went and they were all domestic craft beers. Beers are available in three different sizes: small (230ml) for ¥600~¥700, medium (350ml) for ¥900~¥1,000, and large (500ml) for ¥1,200~¥1,300 with no real explanation as to the random reasons in price differences. There is also a tasting set where you can pick any three 120ml glasses of beer for ¥1,000. The big problem though with these prices is that none of them include tax, so add on an additional 8% to the price of beer. The beers rotate often around Japan, so it’s worth checking the beer listing page before you go. Simple but easy to decide. Pizza! The food menu at Living Craft Beer Bar was simple enough with a few side dishes and a couple of main dishes as you soon find out that there is only one bar man doing everything. Well there was on the day we went and as soon as the crowd picked up, he looked busy and less eager to chat as the evening rolled on. Like the drinks, the food prices at Living Craft Beer Bar don’t include tax so add on the additional 8%. Thankfully there wasn’t any table charge but the evening got expensive very quickly. Living Craft Beer Bar is located in between Nihon-Odori and Motomachi-Chugakai on the Minatomirai line, but the closest we feel is Nihon-Odori. Take exit number three which is the closest and it’s about a five-minute walk. Thanks for the comment and for reading our reviews. We liked Sakura taps, Noge West End and Craft Beer Bar Kannai too. None of these are either owned by Baird Beer or Charcoal Green Grill. If you would like some places, then please let us know and we can put you in touch with some places. If you’re just after a beer then all of the bars are perfectly fine unless we specifically say that something awful happened. We have our own preferences about bars and occasionally it turns up that something other people might not be bothered about (i.e. Beer head) was enough to change a bar from a yes to a no. Also we generally look for an all-round experience so if we didn’t like a bar because the food was crap, but you don’t care about the food, then go ahead and give it a try. When we say that we recommend a place, that means we recommend it over others in the area. Similarly, if we don’t recommend it, it doesn’t mean that you shouldn’t go and give it a try. It means that if it’s a choice between it and another place, choose the other one.